We need to concentrate on a niche. That’s what I’m going to call it by the way because that’s what we call it in England and Europe. So we need a niche for our customers. We don’t want to be all things to everyone because that doesn’t help at all. In one site I read of more than once, I’ve read it being described as ‘a niche should be cut an inch wide and drilled a mile deep.’ So you should own everything about your business, what you do and pick a section of it. So for instance, if you were a clothing company, you might aim for males or females, or you may aim for older people, or you may aim for younger people, or you may pick children, and then you may pick dancewear, or you may pick sports clothing, etcetera, or you may just do footwear. All of these are a niche and then you can drill down further and further and the more niche you get, the more successful your business will be and the easier it is to know more about it than anyone else. That’s why now even in my business it’s far too wide. It could appeal to any business owner or marketing person and at some point or other, I need to learn to niche down and concentrate on a smaller demographic. But this exercise may help you. So, first of all, I want you to draw four circles on a piece of paper. This is like a weekend challenge but it’s only Tuesday. So circle top right, top left, center left and right, bottom right, bottom left. Okay. Four of them in a square. Now in the first circle I want you to write down ‘what you’re good at’ and your ‘most profitable products and services’. So let’s say, for example, take a good old English pub, country pub, maybe. Your most profitable things may be children’s meals, or they might be selling wine, they may be quiz night; something like that. Just figure out what are the most popular things you do. And again, if it’s desserts or puddings or if it’s starters, all that counts. Write these things down. In the next circle, I want you to write ‘how your good stuff differs from others’ that offer exactly the same. So if you’re in a pub, for instance, and you do cater for families, there are going to be lots of other pubs that cater to families. But there are some, such as say in the UK, Toby Carvery that only do one type of meal and say your difference is going to be that. There are others that have huge premises. Others have small premises and no garden. You’ve got a garden. You’ve got big parking, off road parking; all these things. The things that make you slightly different to the others. Are you following this so far? In one of the bottom circles, it doesn’t matter which one, I want you to write down what your ‘ideal business’ would look like. If you were able to do whatever way you wanted, what would it look like? Now, for example, you may not want families there at all. You may want to aim for a younger clientele. You may want to scrap the pub section and convert it into a restaurant that upsells market meals to young couples who spend lots of money on wine. Because these are the things we talk about to the family. Families come along and family make a bit more noise and puts off younger couples. Families they spend lots of money on profitable kids meals because kids don’t eat much. However, at the same time the people don’t drink as much and they don’t order as many bottles of wine, if any, I hope, because they got the kids and maybe you make more money on that. So these are the things. This is why you got to look at this. So what would your ideal business look like? In the final circle I want you to say what ‘types and groups of people would willingly pay’ for what you love to do. Now those groups could be young couples. They could be older people. In the town where I live there is a large middle age and older gay community and what’s called the Pink Pound. Now in these markets, a lot of people cater for them because there you have like two earning people without the expensive children. So they have a lot of disposable income. They eat out a lot and make some people a lot of money. So some people may cater for that. So decide for yourself who would willingly pay. Now finally, I want you to draw a circle in the middle. But that circle is going to cover some intersections. So it covers a little bit of all the other circles because you’re going to find that between those four circles there are going to be some overlapping services and things. So in the ‘profitable section, you might say selling wine. In the ‘what I’d love to do’ I want to cater for younger couples who order wine with the romantic meals for instance. And ‘willingly pay for’ you’re going to say younger couples before they have children, without children. Something like that. There’s going to be some interlocking. And from that, you can start to decide what you might want to concentrate on. Don’t be all things to everyone. Now if you were that pub you’re going to think, “Well I can’t get rid of the families and the meals.” But yes you can. How do other businesses manage who have offloaded that. Or maybe you want to go all out families. But perhaps you want to have weddings. You’ve got to decide. You can’t do it all. Something is going to be very enjoyable for you. Something you’re going to want to do for the rest of your life so getting up is not a chore. You can’t wait to get up in the morning and get to work, to get on because you enjoy it. That’s what you’re trying to find. Find the niche that makes a profit and find the niche that you want to do that’s not difficult. That’s why I enjoy doing this marketing stuff because I love it. That’s why I like talking to you, my owner, yeah you, because I love it. I chose what I want to do and how I want to do it. So think about that. Just make sure, you know, get your brain thinking. You don’t have to think of what to do overnight but just think. Can you niche down? Can you get rid of some things, concentrate on other things? It is a Tuesday, and today’s tool box tip is a free one! There is also a paid version but the free works just fine. It’s online. It’s called WorkFlowy. WorkFlowy is featured in our special free report book which you can get here. It’s great. It’s been downloaded rather a lot of times. I’m quite proud. And people sent thank you emails. Thank you everybody who sent a thank you email. That makes my day. It’s brilliant but it’s totally free, don’t you worry. And then we talk about the things and don’t try to sell you anything at all there. It’s good and it’s all the stuff that I use, my team use, my employees use and we’ve used them every single day. Virtually everything in there is free including WorkFlowy. WorkFlowy, by the way, is in the production section. So what it does is a listing thing. How do you explain? You don’t need any tools to use it. When you open a project, you click on one item, it expands and it says, “Add an item, add an item.” so you have a subsection. And every item you can add a subsection to that. So if you’re thinking of a project, you can have a project of ‘creating a new logo’ and you can have one section of ‘get quotes’, another one of ‘design specs’, another one of, you know, ‘finalize’, another one ‘pay’. And then under each one, break that down into little projects. And when it’s done you just check things off ‘done’, ‘done’, ‘done’ or ‘delete’, checkbox. It’s brilliant. People use it for all sorts, from shopping list to anything. It’s free. Like I say, the best stuff like this, are ones that you can just open up and you don’t have to learn how to use it. You just figure it out instantly in three seconds. Workflowy.com is the fellow for that. 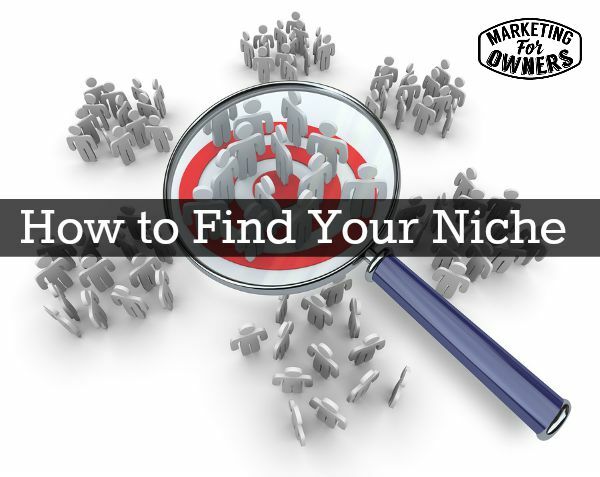 Have you discovered your niche yet?